KATELYN HIBBARD/Sun-Gazette Williamsport’s Jada Whaley goes up for a shot at Williamsport against Jersey Shore during a game on Saturday. All those times Jada Whaley practiced draining last-second shots over her father’s outstretched hands paid off Saturday night and provided her an unforgettable moment. Those previous shots gave Whaley bragging rights. 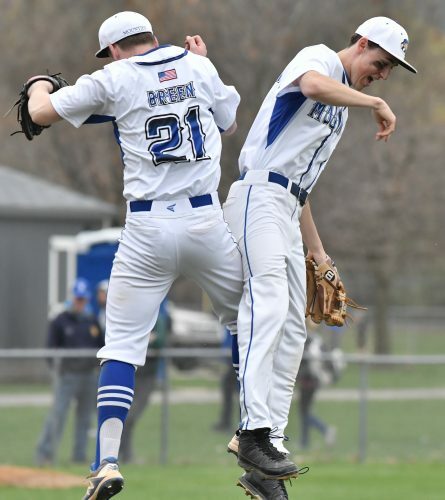 This one and all the ones that followed delivered Williamsport its most thrilling win this season. Whaley hit a long, buzzer-beating 3-pointer that forced overtime against visiting Jersey Shore, dominated the game’s final minute and hit four straight free throws in the last 25 seconds as Williamsport rallied past the Bulldogs, 63-60 in one of the most exciting games any District 4 teams have produced this season. The Millionaires (10-9) overcame a five-point deficit in the last 9.9 seconds of regulation with Whaley scoring all five on her way to totaling 29 points and making five steals. Whaley has played many outstanding games during a fantastic four-year scholastic career, but last night might have been her best. It was a collective effort and a team that was down two injured starters most of the game pulled together at the most crucial times. Still, Whaley was the engine that powered Williamsport and when there was no margin for error, she was at her best. How huge that was on a night all-state Jersey Shore guard Hannah Kauffman scored 33 points and her teammates delivered a well-rounded, determined performance. The lead changed hands seven times in the fourth quarter before Kauffman hit a go-ahead jumper with a minute left and added four more consecutive points as Jersey Shore took a 55-50 lead. The Bulldogs played solid defense on Williamsport’s ensuing possession, but Whaley worked through it and hit a long jumper that made it 55-52 with 9.9 seconds left. When the Bulldogs missed two foul shots at the 4-second mark, Samiyah Little grabbed the rebound. A loose ball ended up in Kalindi Maggs’ hands near midcourt and she whipped a pass toward Whaley who was standing well beyond the 3-point line. With no time to dribble, Whaley lofted a shot that hit nothing but net, setting off a celebration and stunning Jersey Shore. The Bulldogs, though, did not stay down and Kauffman’s 3-pointer gave it a 60-57 lead with 85 seconds left. Whaley then asked to cover Kauffman and provided blanket coverage the rest of the way. She made three steals from that point on and she went to the line for a 1-and-1 with 25 seconds remaining. Whaley, who also had eight rebounds and dealt four assists, already had hit the game’s most difficult shot, so the free throws felt easy. She drained both and then blocked a shot 10 seconds later. Another steal followed and she calmly hit two more foul shots at the 5-second mark, making it 63-60. Fittingly, Whaley made her last steal on the inbounds pass clinching Williamsport’s most dramatic win. So too were the contributions of her teammates. 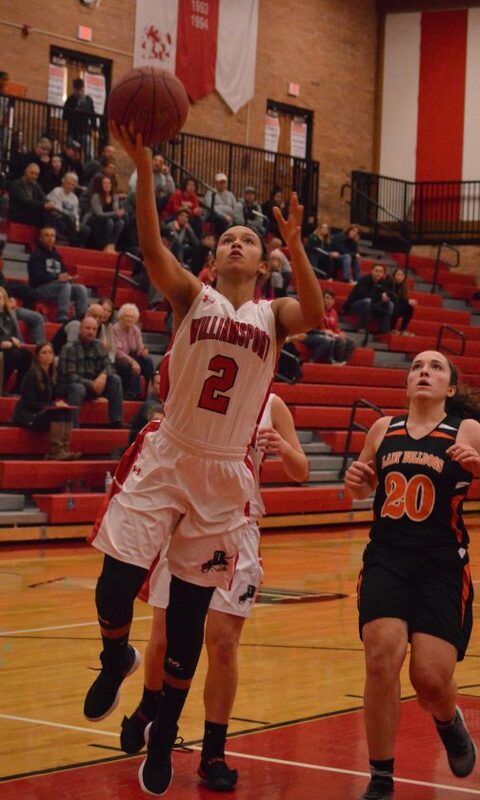 Williamsport was already playing without second-leading scorer Katelyn Wilson who sat out with an ankle injury. Then Little was injured early in the second quarter and did not return until the third. Starting guard Fondrea McClain missed most of the second quarter with an injury then suffered a concussion early in the third and starting forward Emily Pardee picked up three first-half fouls. Through it all, Williamsport persevered. Little returned and played a dazzling game, scoring eight points, grabbing 13 rebounds and blocking eight shots. Maggs hit four clutch second-half shots and produced a career-high 12 points. Freshmen Kailee Heimrich and Serina Beiter provided valuable minutes and Pardee made some key late defensive plays. 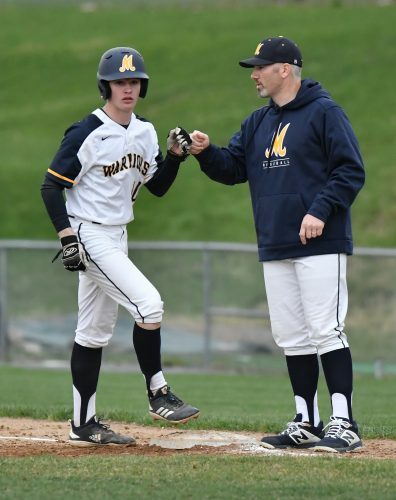 These are the games Williamsport would have lost in the past, but the Millionaires have won four out of their last five and showed they are both talented and tough last night. Last night was not about Jersey Shore losing a game, it was all about Williamsport winning it. The Bulldogs (11-9), a team with three new starters this season, played an outstanding game, erasing a six-point second-quarter deficit and quickly responding whenever the Millionaires took a second-half lead. The second-half lead changed hands seven times and the Bulldogs kept answering as they matched Williamsport’s quickness and fought hard inside. Williamsport led by one at halftime and Kauffman’s coast-to-coast layup tied it 40-40 after three. Whaley made a steal and layup to put Williamsport up 50-49, but Kauffman came back and sank a long jumper before making the four straight foul shots that looked like might seal an exciting win. Kauffman was sensational once again, scoring 33 points, making six steals, grabbing five rebounds and adding four assists. The senior scored 16 points in the fourth quarter and overtime, doing damage inside and outside. Sadie Griswold was all over the court, recording a double-double with 10 points, 12 rebounds and six steals. Brielle Hess added steals and Aubrey Stetts scored six points. Ultimately, Jersey Shore was hurt at the foul line where it made just 16 of 34 shots. Still, the Bulldogs gave a strong performance and showed why they could be a tough District 4 Class AAAA opponent if they build off this game. Hannah Kauffman 11 10-17 33, Aubrey Stetts 2 2-5 6, Sadie Griswold 4 2-3 10, Hailey Stetts 2 0-2 5, Reba Lorson 0 0-0 0, Brielle Hess 2 2-7 6, Aubrey Schilling 0 0-0 0. Totals 21 16-34 60. Jada Whaley 10 6-6 29, Emily Pardee 1 2-2 4, Samiyah Little 4 0-0 8, Fondrea McClain 1 0-1 2, Kalindi Maggs 5 1-1 12, Sophia Erb 1 0-0 2, Kailee Heimrich 2 0-0 4, Whitney Felix 0 0-0 0, Jessica Robinson 0 0-0 0, Serina Beiter 1 0-0 2. Totals 25 9-11 63. 3-point goals: Jersey Shore 2 (Kauffman 1, H. Stetts 1), Williamsport 4 (Whaley 3, Maggs 1). Records: Williamsport (10-9), Jersey Shore (11-9).